Revenue in the Consumer Electronics market amounts to US$12,333m in 2019. The market is expected to grow annually by -0.3% (CAGR 2019-2023). In global comparison, most revenue is generated in China (US$243,094m in 2019). In relation to total population figures, per person revenues of US$265.6 are generated in 2019. The Consumer Electronics market comprises electronic and digital devices used privately either for entertainment (television sets, radios , etc. ), communication (telephones, smart phones, etc.) or home-office activities (printers, copiers). Consumer electronics and household appliances (such as washing machines and refrigerators) are often sold by the same retailers, but the latter are excluded from this market outlook as they serve a purpose different than the one mentioned above. Big brands in this category are Samsung, Dell, HP, Apple, LG, Sony, etc. The Consumer Electronics market is driven by innovation – a constant improvement on existing products and their blend in creation of new commodities. This is why many of the devices contained in this market have more than one purpose (e.g. smartphones can be used as cameras, radios, etc. ), and, in order to realize a consistent segmentation, focus is on their main function. The Consumer Electronics market only includes retail sales. Reading Support Revenue in the Consumer Electronics market amounts to US$12,333m in 2019. 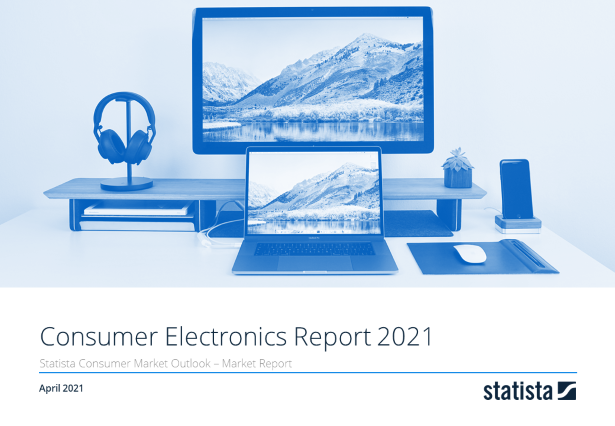 Reading Support The Consumer Electronics market is expected to show a revenue growth of -0.4% in 2020. Reading Support The average revenue per person in the market for Consumer Electronics amounts to US$265.6 in 2019. Reading Support In the market for Consumer Electronics, volume is expected to amount to 77.8 m pcs. by 2023. Reading Support The market for Consumer Electronics is expected to show a volume growth of -0.2% in 2020. Reading Support The average volume per person in the market for Consumer Electronics amounts to 1.67 pieces in 2019. Reading Support The average price per unit in the market for Consumer Electronics amounts to US$159.05 in 2019. Reading Support With a market volume of US$243,094m in 2019, most revenue is generated in China. Here you can find more studies and statistics about "Consumer Electronics".